topped with rich caramelized onions, a toasted baguette slice, and melty Gruyere cheese. Whether you make these for a celebration or just because, this is the perfect dinner for two! I've never been one to go out to dinner on Valentine's Day. Not in a very long time at least. I would much rather cook a special meal and enjoy being at home with my family. When my kids were younger I always let them choose what they wanted for their special dinner, but now that they're older I like to surprise them. This year I'll be cooking for two, myself and my youngest son, so I want to make us something special. 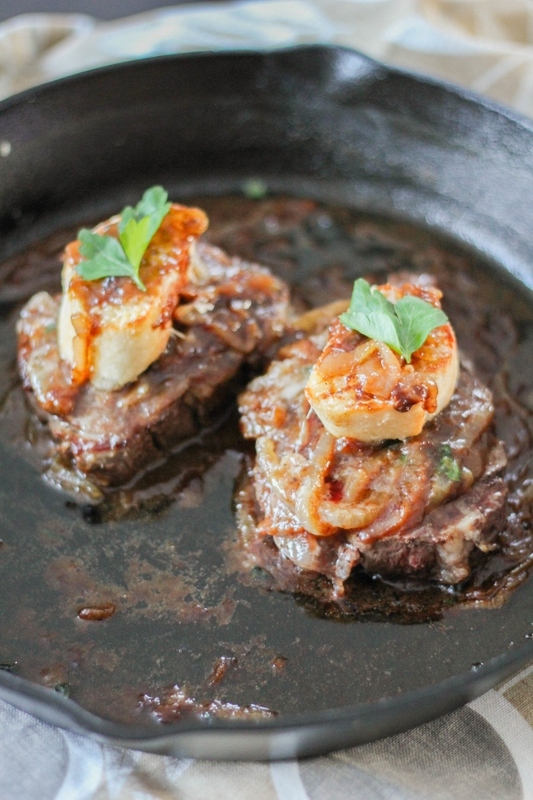 I love a good steak, especially a filet, so I've created the perfect dinner for two with this French Onion Filet Mignon. 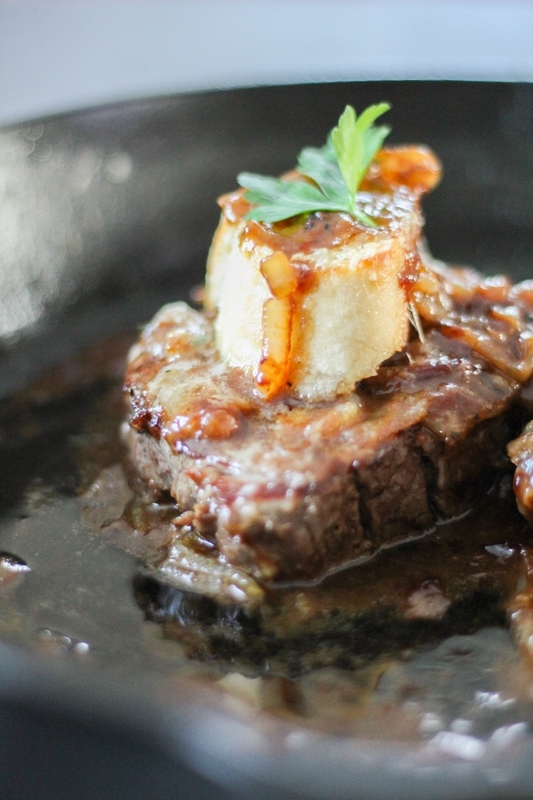 If you're a fan of french onion soup then you will definitely love this meal as well! The steaks are pan seared in a cast iron skillet so they get a beautiful crust on the outside, but the inside stays nice in tender. 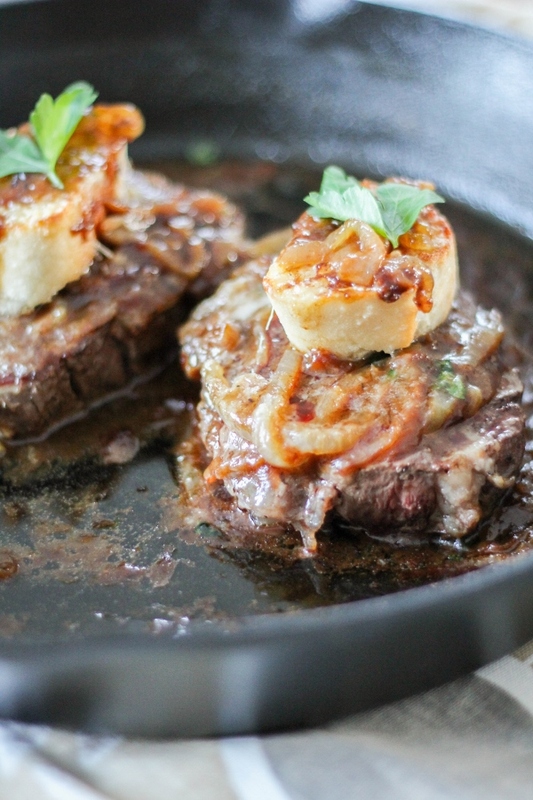 Caramelized onions are the base of a beautiful sauce, then the steaks are topped with a baguette slice and a touch of Gruyere cheese. The flavors are truly decadent. 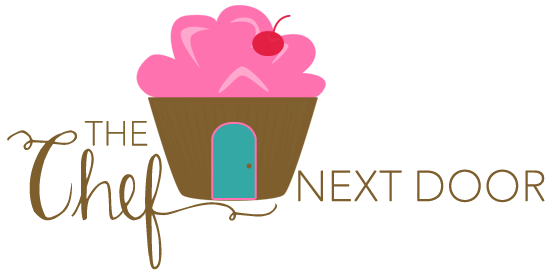 Be sure to check out more amazing easy dinners for two from my #SundaySupper friends below! Preheat a cast iron skillet, or an oven safe skillet, over medium-high heat. Add two teaspoons of the olive oil. Season both sides of the steaks generously with salt and pepper. Add the steaks to the hot pan and cook, turning once, until desired doneness, about 5 minutes per side for medium. Transfer the steaks to a plate and loosely cover with foil. Add the remaining olive oil and the butter to the pan. Add the onion and cook over medium heat, stirring occasionally, until the onion is golden brown and tender. Sprinkle the flour in the pan and stir to coat. Add the broth and parsley and cook until thickened. Turn the heat off and place the steaks back in the pan. Top the steaks with some of the onions. Add a baguette slice to the top of each steak, then sprinkle a quarter cup of cheese over each slice. Transfer the skillet to the oven and broil until the cheese is melted and starting to brown. 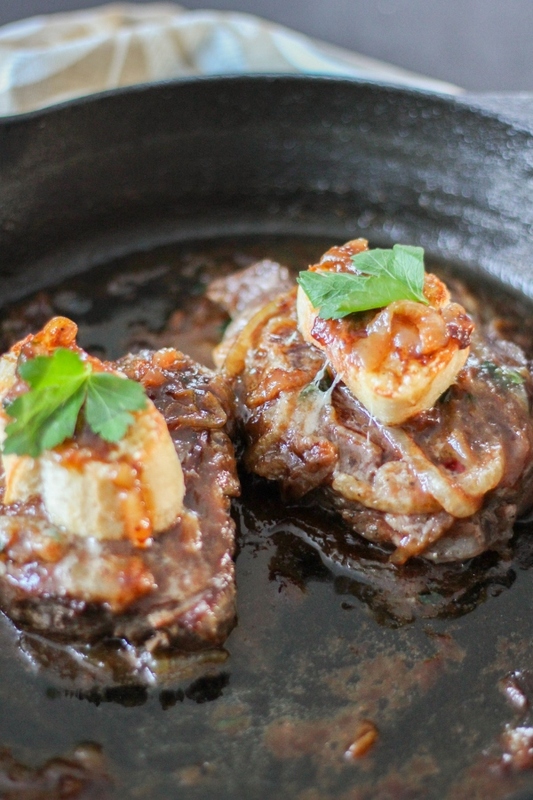 Serve the steaks with the onions and more sauce.